I love your analysis mate. Sorry which system has a DM(D)? How did you manage the MC(D) to close down less ? Why would U create a 2vs1 on the flank? It's very possible that the second player of yours, would activate that your opponent has to send another defender to you. That makes 2:2. 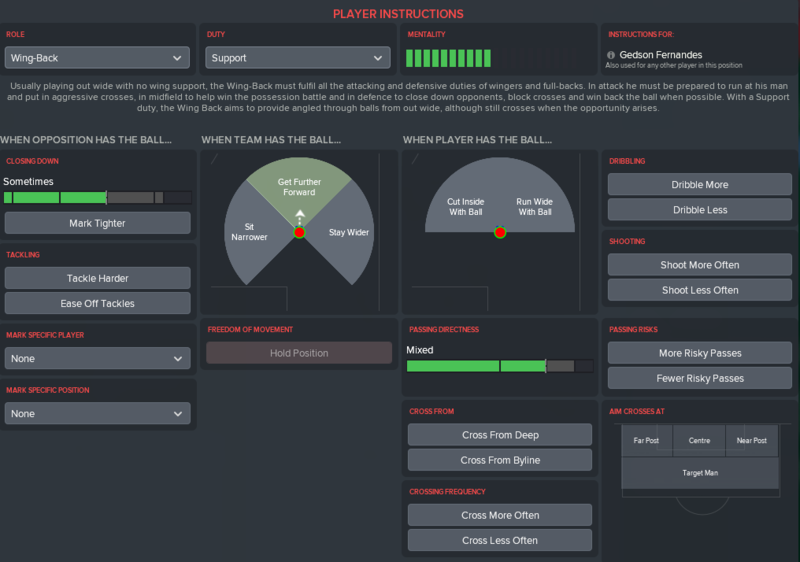 I prefer 1:1 above 2:2, especially if you have a winger with a high attribute for technique. Thanks for the very informative post, I'll be following along keenly. I wanted to ask you what your thoughts were on loaning out youth players and if you had anything that you specifically looked for in a player before you would send him out on loan. I remember reading an old post by SFraser a year or two ago and he said that he wouldn't be loaning out a player unless his determination was at least a 15. I personally thought this was maybe a bit much to ask, however any time I have actually loaned out a youth player I noticed that they don't seem to develop as much as what they would have done if I had just kept them and trained them at my own club so perhaps SFraser was correct. yes i agree that,& that can be one of the part in the plan. its can be a "decoy". i pull them down side so some space will be empty.I can get some body stepping in. Did you sign some new guys to bump it up to that? Your post suggests was already like that? Ah I love your threads but tbh, they're frustrating in a sense that all I want to do is play fM for hours after I read them. My main concern with things like this is I get bored once I win. I currently have a Andlercht/Belgium save going similar and in season 2 we've made it to the CL Qfs again, the only thing that will take us beyond is heavy investment..not sure if I want to do that tho as I prefer to promote but the ability isn't completely there and the players get high enough, but can only fetch fees of maybe 20m. Are you at all concerned that such easy success with such a young team will lead you to being bored? 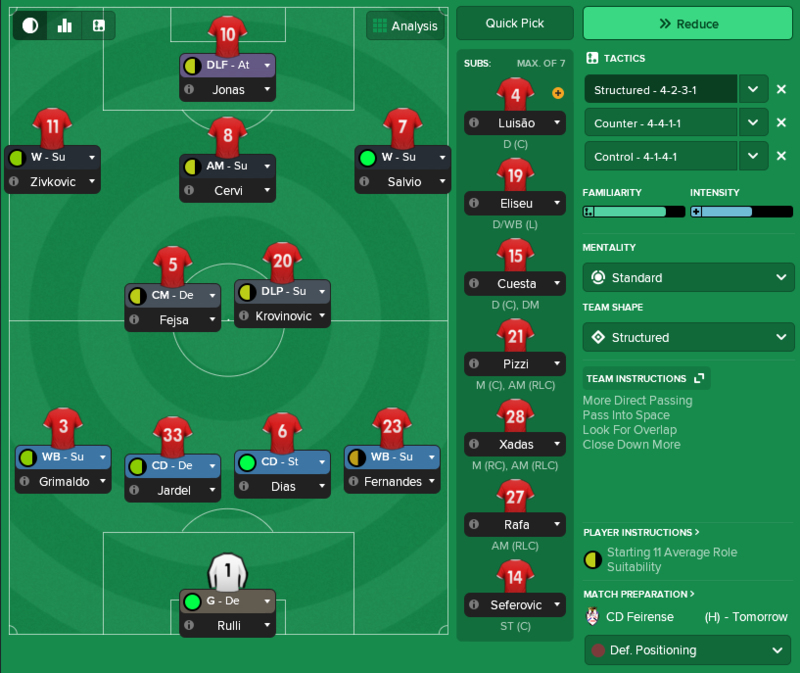 I've always contemplated an SLB save cuz quite frankly, their youth academy is stacked in game. They also just won the U-19 Euros, with a few players mentioned here. I fear that I'll just...be pushing out the older players as soon as possible to use my younger new ones haha. Either way, love this thread and the old Cruyff one and followed it closely. Cheers for everything you share here. @Ö-zil to the Arsenal! with what program are you setting up those lines in your analysis? Which software did you make those graphics with? We certainly didn't set the world alight but the ruthlessly efficient league form continued after the winter break with a winning run stretching all the way to March, as good as deciding the title right there. Tying up the title a few games early meant an opportunity to hand out a few late league debuts and try an experimental starting team. Until that point, the first team stayed reasonably consistent. 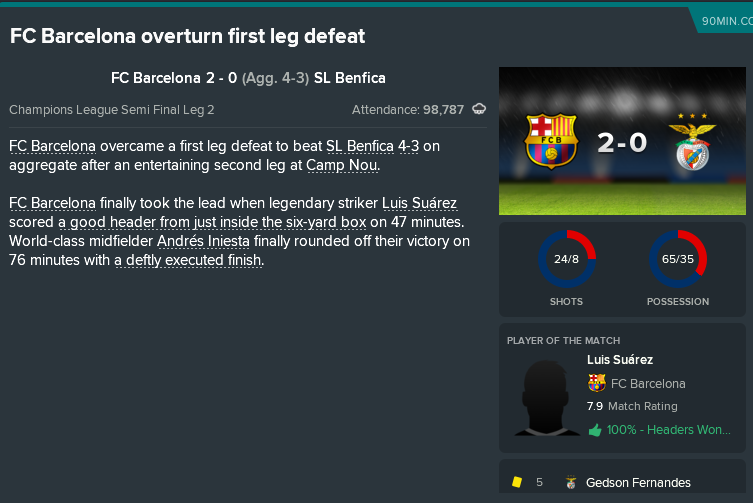 After finishing off PSG, unfortunately Barcelona proved a step too far in the Semi Final. ..but managing a comeback victory in the first leg was one of the highlights of the season. 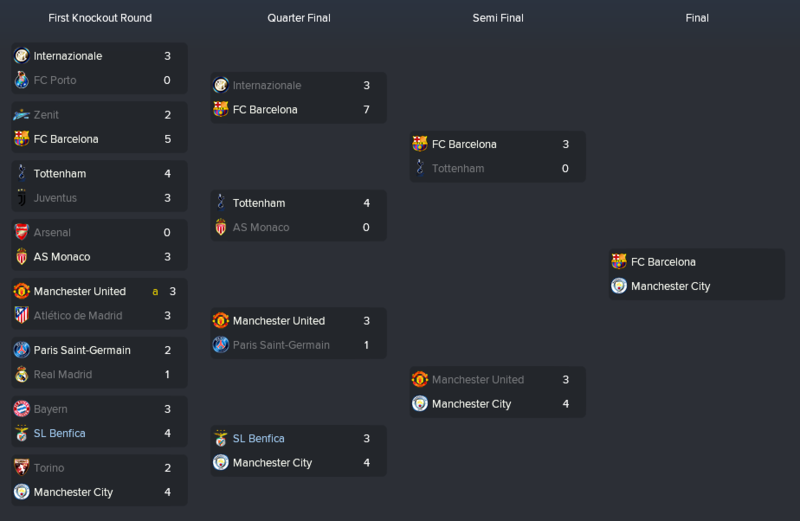 Barcelona went on to be defeated by Pep's Man City in the final, who also picked up a league title pretty much establishing themselves as the main powerhouse in Europe at the moment. The disadvantage of our Champions League run has been vultures circling the first team. Going to be an interesting summer in the transfer market! Lots of positive developments on the players coming through. 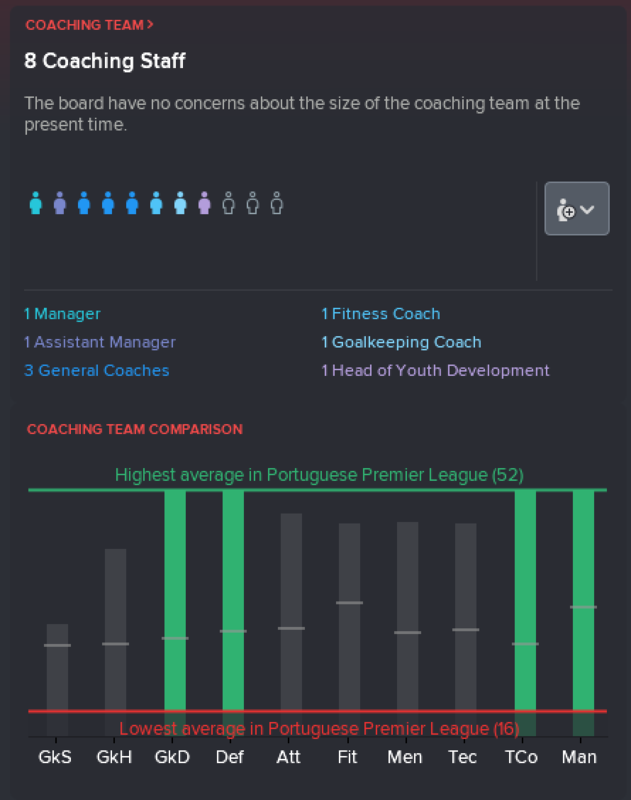 I'm going to play out the summer holiday season and do a development update at the start of pre-season. @Ö-zil to the Arsenal! can you explain why you use WB's on attack in your 4-4-2? I use FB's in mine or else my flanks are left wide open. Thanks! Also, thanks for writing this up, I like to build with youth and this is a great read. Pretty sure that it's "dribble more", because there are screenshots of his CM's and it shows the "dribble more"
Hah, yeah, just noticed that, thanks! i saw my winger got many change to make this run when i face a bus parking AI. Its as much about the supplier as the winger. Ill mention u in my recent thread as i have an example of this movement. Excuse me, everyone. Fallen a little behind on responding to queries. 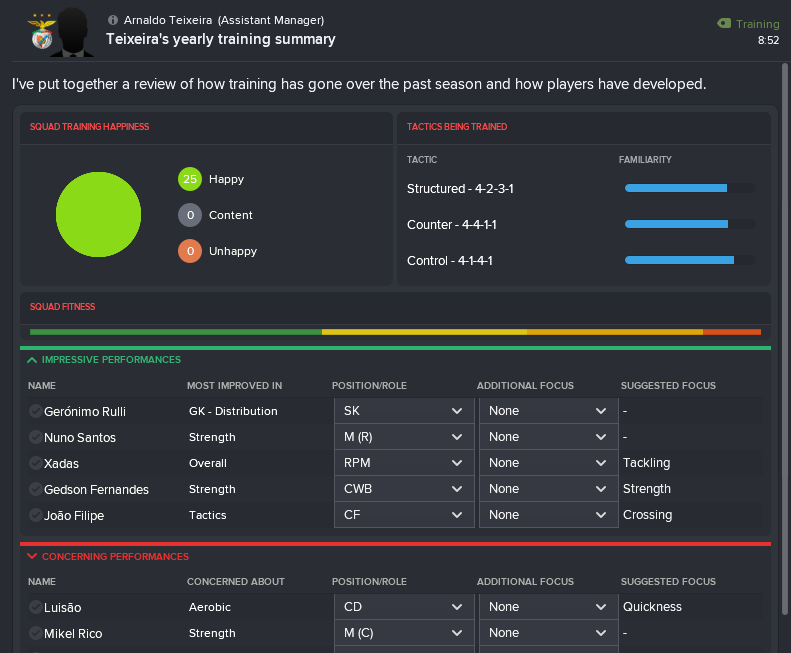 I am experimenting with loaning players out for 100% of their wages and a small monthly fee. Over the year that is £2.5m revenue at zero cost whilst - potentially - developing the player and increasing his value. Potentially an interesting way to keep up with the big money clubs. Yes, brought in a couple of coaches and scouts. Always fill up the quota. Nothing crazy, pretty much restricted to scouts available for free. There's a bunch of good ones coming from South America. If you're after names then I can have a look next time I fire up the save! Everyone plays differently and personally I enjoy creating styles of football in the match engine, more than achieving a particular challenge. Most of my saves are 2-3 seasons with a top quality side, playing a particular way. 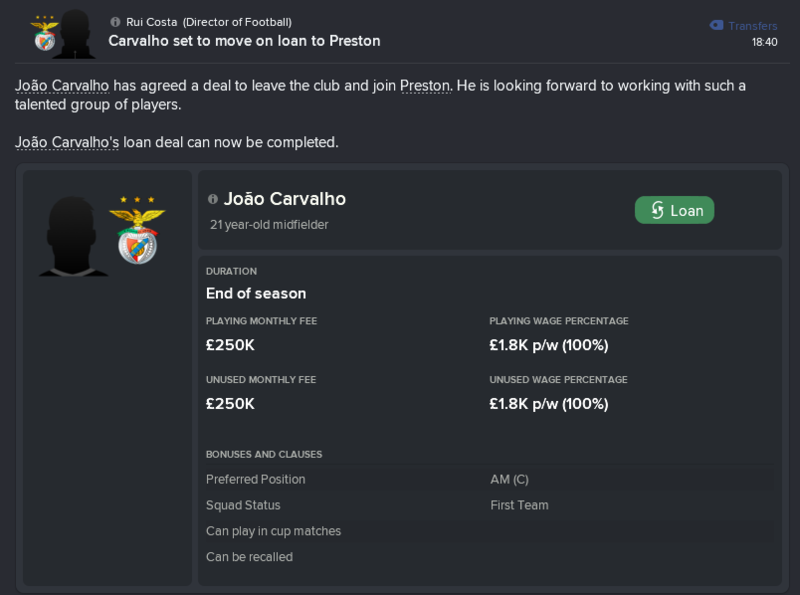 This time adding developing players from a young age should at least increase that to 4-5 seasons, maybe more if I go to Portugal or another club. I'm not anticipating a particular challenge but I am excited to see what I can create in the match engine with players trained specifically from such a young age. The decision of the role - wingback vs. fullback - is purely down to personal preference based on the Player Instructions template. Wingback offers a little bit more in attack - dribbling, staying wide, crossing more etc. This suits Grimaldo and Gedson Fernandes well. Wingers roam from position so wingbacks guarantee attacking width and both central midfield players hold position so we have good cover. Wouldn't be overly committed to this choice, if I see any reason to change. If I went for fullbacks I'd stop wingers roaming and maybe add a midfield runner. Attack vs Support (vs Defend) decision comes down to the balance between Team Mentality, Team Shape and Team Instructions. Standard mentality gives us a balanced start point. Structured team shape makes attackers more attacking and defenders more defensive, reducing Individual Mentality slightly. Look for the Overlap slightly increases their individual mentality back to neutral. Counter mentality slightly reduces Individual Mentality. Structured team shape makes attackers more attacking and defenders more defensive, thus further reducing Individual Mentality slightly. Look for Overlap is no longer enough to counter-act both of these factors. An Attack duty, counter balanced by a Control mentality and Structured shape comes out quite balanced. Use a role with the instruction Cut Inside With Ball. Use a player with 'cuts inside from x wing' as a trait and give them some creative freedom. Inverted Winger can stay wide, get forward, cut inside with the ball and cross more? TI low crosses. Inside forward can do the same without cross more. Winger can do the same without cutting inside. Wide Midfielder will do whatever the hell you want but no player is ever going to be seen as suitable for the role! Saw you got £250K per month for Joao Carvalho and was wondering what you default setting (via Responsibilities) for offering players out for was? @kpsia518 try inside fowards with "stay wider" selected. 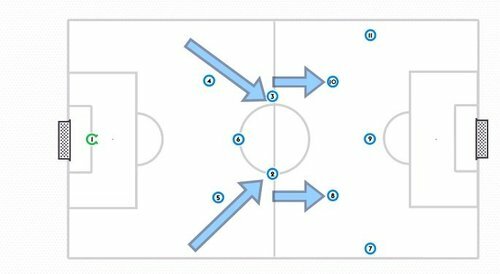 I've been using a possession tactic with two IF (one Su, one At) "Stay Wider" and they get fed by one of my dual playmakers to make similar runs, often then cutting it back to my CF-Su or the opposite sided IF. As ÖP suggested, I have Low Crosses ticked as well. Hate that about the WM role. I love using it, and while I don't care too much about the circle colour, it's mildly infuriating that no player is ever suitable to play there, even after a whole reason playing it. It's a strange role in the game, and idea if it has any hard coded actions? On the loan thing, you set % not price though? You set % wages, but the monthly fee is price. 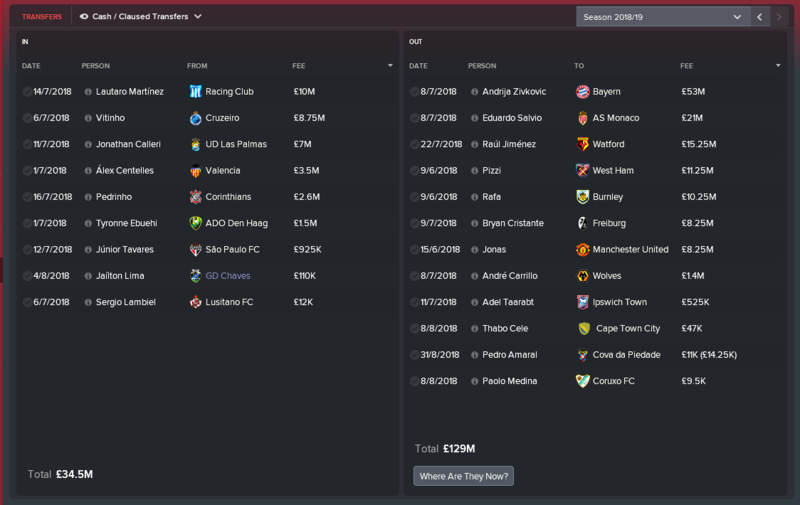 I usually ask between £100k and £250k depending on the quality of player and the interested parties - in South America I could barely get fees, but if I'm in a top European division I'll often take in £10-20million per window just on loan fees. You can have your settings default to a % of the players value for the monthly fee (which is on top of the wage%). Which is useful if you let the Director of Football or someone else negotiate loans. One thing I'll do is look at the prospective club and see what they pay players of a similar quality in salary. If my guy is making a lot less, a realistic monthly fee to ask for is something that bridges that gap. @Joey Numbaz forgot about that setting! I don't like it as I find you'll struggle to get more than £250k monthly fee for any players valued £10-40million as the lower valued ones are targeted by poorer clubs whilst the higher valued ones tend to be on higher wages which usually leads clubs to move around their finances leaving less to spend on the fee. Hey mate couple questions on the B team. Did you find you got any kick back from players in moving them to the B team? Also does the B team budget come out of the 1st team budget? Hey Ozil, great work again. Just wondering about PPMs in this and what you look to train players to do. I'd guess there would be liberal use of 'Plays short simple passes' for the defenders and 'Plays one-twos' for most of the others, but are there any others you like to go for in terms of movement etc.? Off topic but how do you select tactics for the youth team? I can't select on the tactics screen nor the youth tasks screen. Staff responsibilities > Under 19s > Set Tactics. You can either set the same as the first team, let the U19 Manager decide or set a formation. But don't you set a different set of tactics specifically for them? Or is that just your third option in your first team, and when passing days you have it active? 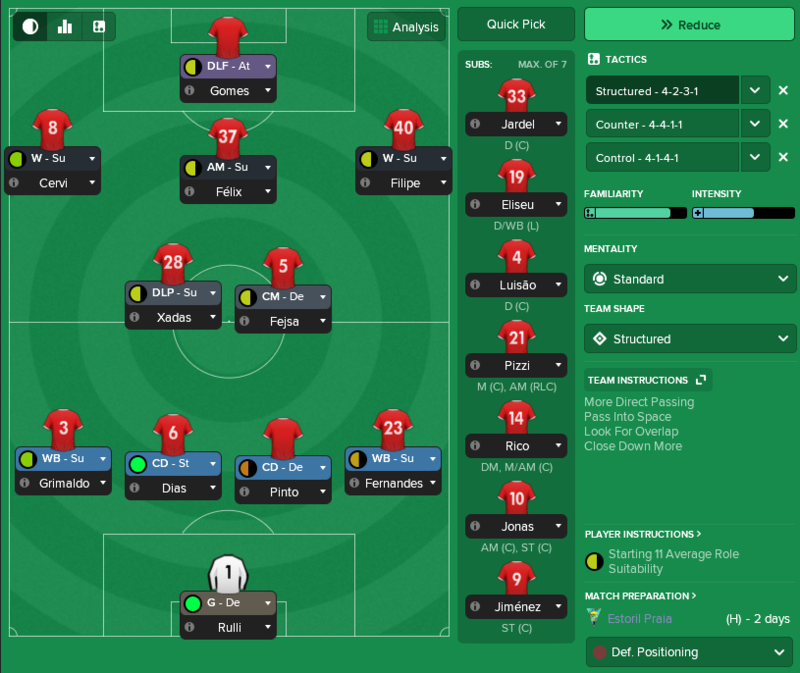 I set a 4-1-4-1 formation for the U19s which means João Tralhão - U19 Manager - selects the mentality, roles, instructions etc but allows me to control certain things such as using MR/L rather than AMR/L so players build up familiarity their and Dantas selected as a DM etc. When I give young players an option in the cups that's First Team so obviously I have full control over the tactics. I don't move players between squads for each game, I use Squad Filters to pick players from the U19s and B Team. Sometimes there will be another match happening at the same time in either of the other teams so I plan ahead and make sure any players I wish to select for the cup match do not play either match. Selecting players for the U19s and B Team seems to work similarly to "use current team selection when possible" when on holiday. Ah cheers, it must be me being still on fM17 that I can't do this btw, I read over parts of this thread literally every single day. So you created that possession tactic just to play in cups with youngsters or you will get into that in the future? That's the way we are going. The point I am trying to get across is that the existing squad - particularly Fejsa, Jardel, Luisão and Jones - are exceptional players but suit a different style of play. The youngsters coming through can play the way I want them to, within reason depending on their ability. As they develop I intend to develop the style of play further. 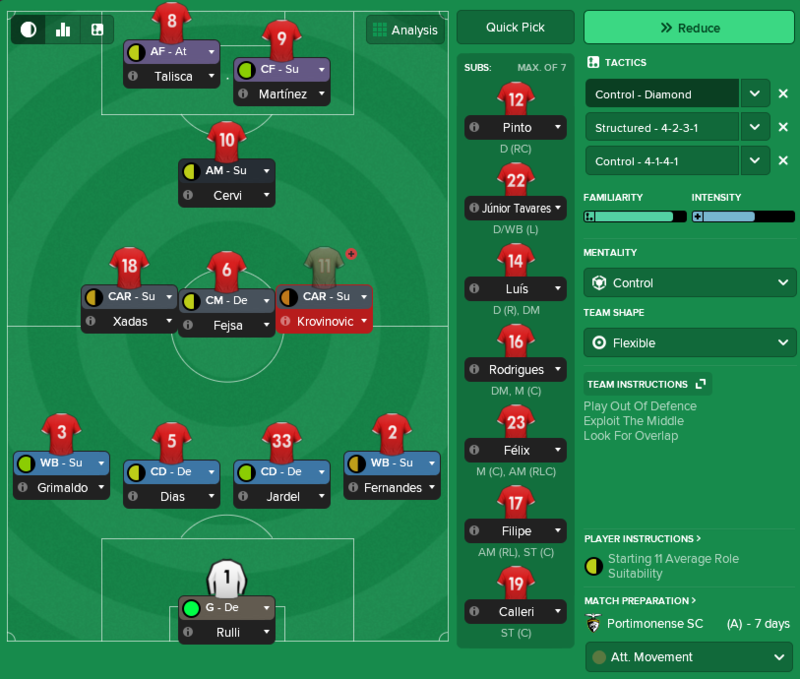 I have been messing around with the possession tactic as one of my three tactics this season. I've got a very good team. 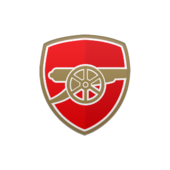 Won the EPL the year before, and lost in the Champions League Quarterfinals on away goals. This year we are a solid second (United is just so good come 2021, just amazing signings), and back in the Champions League QFs, we'll see how we do against Bayern, who has dropped to 3rd place in the Bundesliga. After watching France in the World Cup, I've taken my team the route of prevent goals at all costs and score enough to win. 30 games into the EPL season we have allowed just 18 goals, scoring 57 (United are 74-16, just amazing). 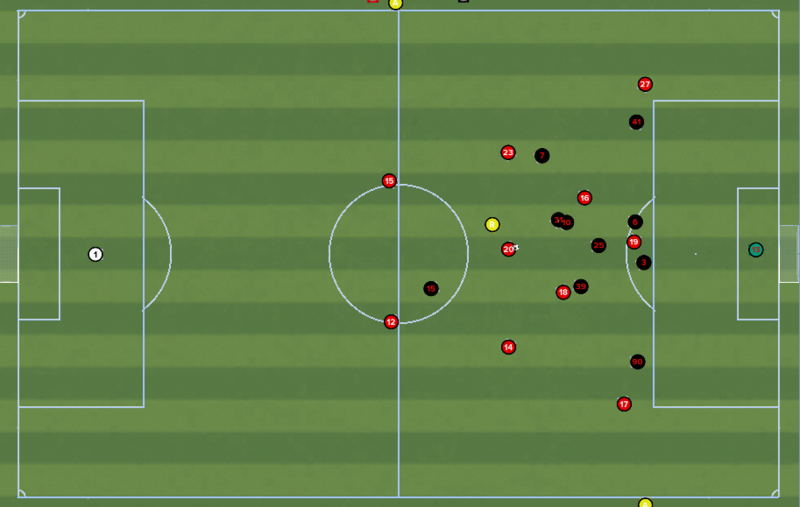 Anyway, the possession tactic is super defensive with my players. But first some perspective. I adopted this great defense first tactic for this season, although I've made the sweeper a libero-attack and the DLP plays on support most of the time, not defend, for me. My point is that, this is a very intentional defense first tactic. It's created one clear cut chance every 68 minutes, allowed one every 98 minutes. Against similar rated teams I'm up 14-10, against smaller, I'm up 22-15. Obviously my players are good and I assume they just finish better than my opponents which is why my goal differential is much better than my chance differential. Those numbers are over 2470 minutes. My second tactic is based on Cleon's art of attacking a 3-4-3 that the game calls a "5-1-1-3 DM WB Wide Asymmetric M (CL)". This is supposed to be much more attacking, though in 757 minutes, I create a chance every 58 minutes and allow one every 94 minutes. Interesting how it doesn't play that much differently than The Great Wall of Italia. I only tend to use it if I am looking for goals. It's 5-6 against similar teams and 8-2 against smaller teams. I should probably use it more when playing teams down the table. But I digress. I gave the other numbers just to give some perspective of what my team does with other tactics. Pretty similar when deployed in appropriate situations. 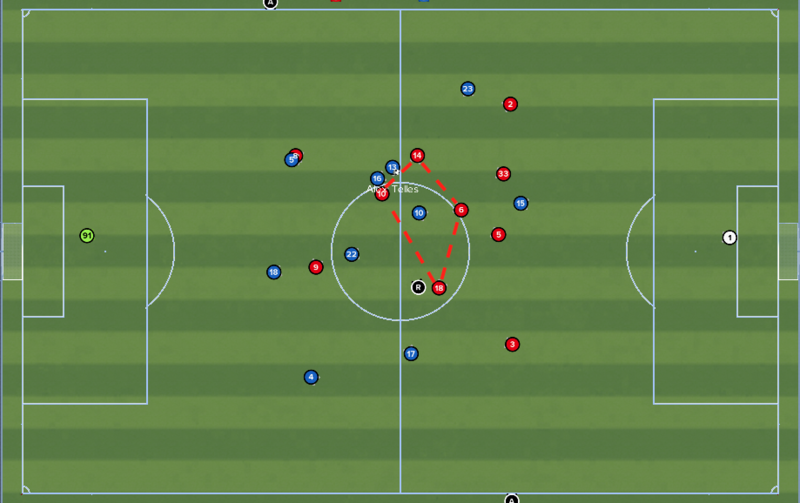 The 4141 possession tactic here seems to really be a defense first tactic to the extreme. One chance every 103 minutes. One allowed every 124 minutes. In 621 minutes, 6 chances for, 5 against. 3-3 vs. similar teams, 3-2 vs. smaller teams. I thought seeing some perspective on how it plays out compared to some others might help you with tweaking it to do what you want or spotting some things earlier, since you've only been able to play it in Cups so far. I understand that everything plays different based on the players, etc. But by design I have some very versatile players and I am always tweaking and adapting systems. This one seems to be great defensively, especially for closing out games, but could use something to push the offense a little. I have noticed this with my youth teams too. They are great and win a lot. I've won the EUFA youth league a few times, etc. But with this tactic, I see a bunch of games where we outshoot an opponent, 16-5 or something, get 3 chances (I assume only 0-1 is a CCC though) but only 5 shots on goal and draw 1-1 or 0-0 or something. Yeah, all that stuff I said yesterday, I might have to take it all back. Holy cow has the possession tactic performed well the last couple of games. Maybe 621 minutes and 6 months of practice isn't quite enough to get perfect with it. But 6 months, 2 weeks and 143 more minutes of playing it? Now it's insane. I guess my sample size was smaller than I realized. 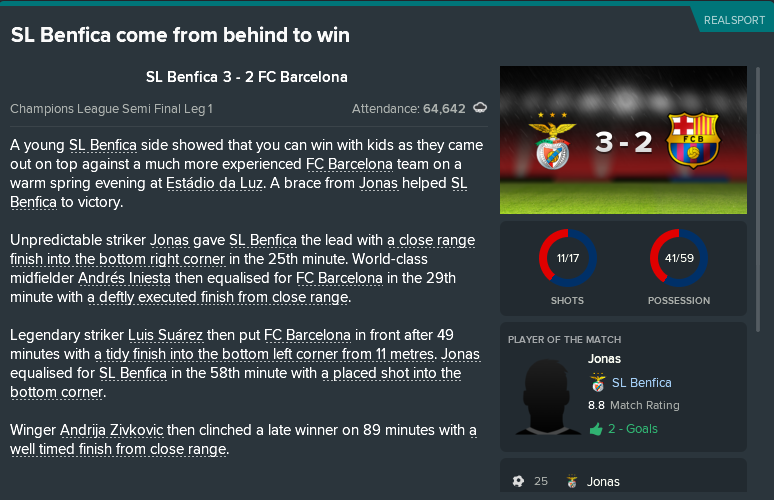 Manchester City, who isn't great anymore, was beating us 3-0, so I switched to this late to just keep it from getting any worse and we played well. So then I used it the next game against Stoke after going up 1-0 and it played great. But then, in the Champions League Quarterfinal v. Bayern, we were up 2-0 at halftime so I went to this again. We dominated the second half, scored two easy goals and played excellent possession soccer. I am really becoming a fan of this. Since that post in 143 minutes we've created 6 chances and allowed 0. This is now at a chance every 63 minutes - I created 6 chances the first 621 minutes - and 6 more in the last 143. And we've now only allowed one ever 152 minutes. Sorry for the premature comments. Nothing to see here. Carry on. Updated chart because why not? I might have to move this to the main tactic. But who knows, maybe it works better as a change of pace. Zig one way then zag at halftime with this? Let's start with a bit of context, from the 2017/18 season. Alternating to a counter attacking 4-4-1-1 when the going got tough. The title was won by a solid defensive foundation. 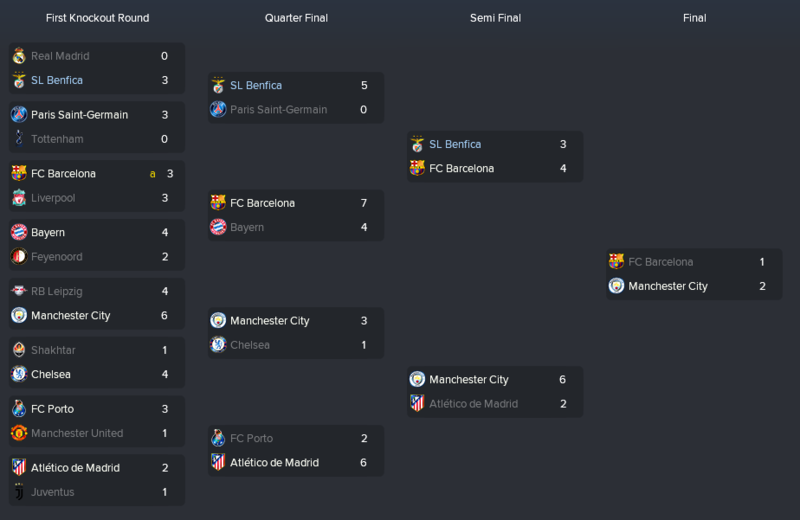 Relied heavily upon our defence in the Champions League, shutting out Real Madrid and Paris St Germain to reach the semi-finals. Attack was efficient, yet unspectacular. We were very effective against teams who came forward to attack us. Significantly less effective at breaking down teams who sit deep. Tactics in the Portuguese league are reasonably conservative, facing a relatively high proportion of 2 DM formations. Transfer strategy was to negotiate up and ultimately accept lucrative offers for first team players. Opening opportunities for young players coming through. Establishing a strong financial foundation. Lautaro Martinez was brought in for the first team as a potential long-term option at striker. Lautaro Martinez was chosen for his high potential ability, intelligence - specifically anticipation, decisions and off the ball movement - and well rounded attributes. Our squad for the 2018/19 season is now pretty much the same defence, a similar midfield and a new look attack. Can be effective against 4-3-3 and 4-2-3-1 variants. Last season our strategy was direct passing, aiming to exploit the pace and skill of attacking players before the opposition can organise their defence. This season we switch to a Control mentality in exert greater control - obviously - over opponents. 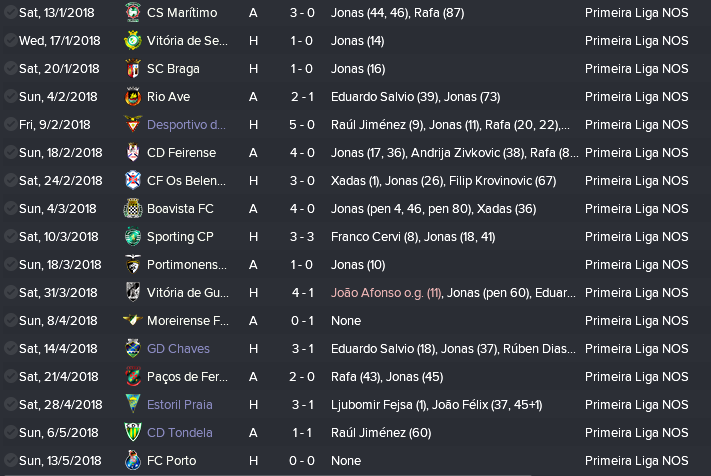 Opponents in Portugal typically sit quite deep so this allows us to take the game to them. Last season a Structured team shape to make attacking players more attacking and defensive players more defensive to facilitate a more direct game. In this system, a Fluid team shape would give us greater creativity and control over central areas. Control over the centre coming from attacking and defending as a unit. Attackers having a lower mentality making them more likely to be involved in midfield. Defenders having a higher mentality - again - making them more likely to be involved in midfield. The issue with this is that a number of our key players have quite specialist sets of attributes. Jardel & Dias are excellent defenders but - with low passing, technique, first touch & vision - have limited technical ability. Talisca is a dangerous attacking player but - with low team work, work rate & defensive attributes - is not inclined to track back, nor would he be effective. As a result, we line up in a Flexible team shape encouraging players to balance their individual duty with the team mentality and their position on the field as well as giving them a balanced level of creative freedom. Increases the mentality of my DC(D)s and MC(D) increasing compactness with the Fullbacks & Midfielders on Support duty. Once again using @fmFutbolManager's Mentality Calculator spreadsheet, we can see how these combine to distribute positive yet balanced mentality throughout the team. Our core defensive unit is intelligent, brave, strong and good in the air and sets up in a simple DC(D) - DC(D) - MC(D) triangle. In this instance I choose an MC(D) over a DM(D) to avoid reducing our defensive line and I have a personal preference for using players in bands. Ahead of our defensive core we have a midfield unit of intelligent, technical and hard working players. Moving into the AM strata to create a 3v2 against opposition 2x DM formations. Dropping deep alongside the holding midfielder to create a solid defensive block. Covering lateral spaces in the absence of an additional wide player on the flanks. Both are asked to Run Wide with the Ball to add some dynamism to our attack. Notice how the combination of Team Mentality, Duty and Shape gives them a balanced, yet expansive Individual Mentality - exactly as I like a midfield to play. Finally we have a 3-man attacking unit. Franco Cervi is an Attacking Midfielder (Support) asked to dribble more, aiming to cause havoc ahead of the opposition defenders. Lautaro Martinez is a Complete Forward (Support) roaming from position to create space for others and take advantage of space wide. Talisca is an Advanced Foward (Attack) as he has the best finishing and movement of the three. Welcome to Benfica vs Porto, one of the key matches deciding the Primeira Liga. 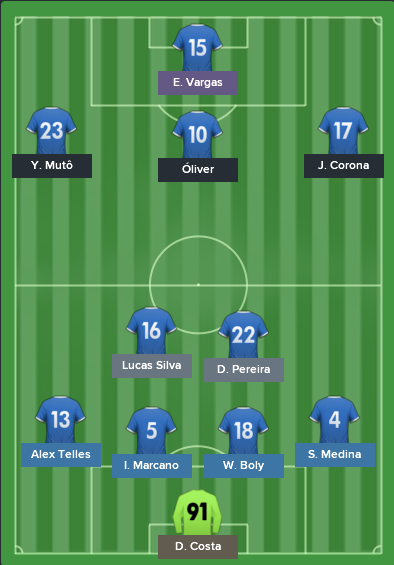 Porto line up in the 4-2-3-1 DM which we struggled to break down - drawing 0-0 home and away with Porto - last season. Porto are looking to build an attack through their wingback, Alex Telles and we have formed out default medium block defence. Diamond midfield shifts across, shielding the defence. Carrileros take wider positions, closely supporting the wingback. Martinez drops deeper, pressuring the opposition DMs. Attempt to attack wide and cross. 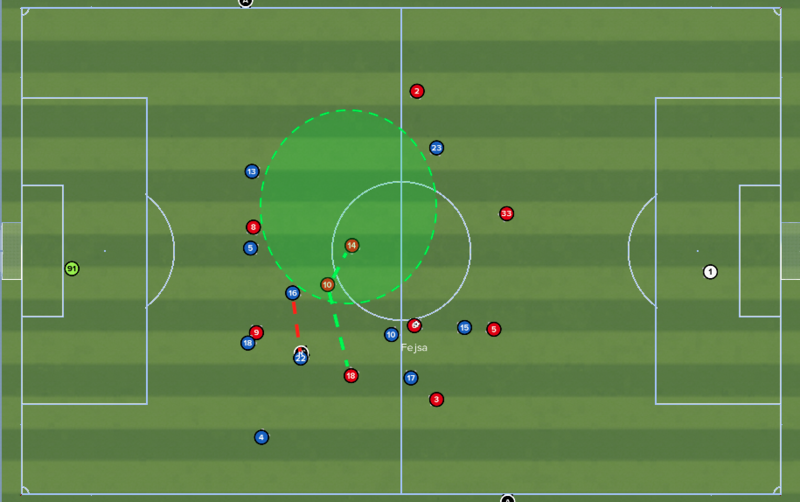 Go in-field to their defensive midfielders and attempt to build from there. This is also a good example of why I do not like 4-4-2 diamond for high-pressing defensive set ups, unless I have extremely hard working & intelligent strikers. Opposition fullbacks are in acres of space so act as an immediate 'pressure valve' for the opposition. The distance any player would have to travel to press means a) they'd open a gap and b) the ball would be long-gone by the time they got there. When Porto try to attack wide, we see this shape. Right sided Carrilero is again tucked in very close in support of the wingback. Fejsa is marking the opposition AM whilst our centre backs have a 2v1 ahead of the attacker. Cervi and Martinez have both dropped deep, putting pressure on opposition DMs should they wish to recycle possession. Alternatively, when they go centrally they just run into heavy traffic. Similarly to Porto, we also build up through our fullbacks. Porto have a reasonably strong defensive structure. Their Wingers are defending narrow which would be an issue if we were looking to play through our defensive midfielder. Fernandes is under no pressure and has plenty of space to take the ball forward himself. Our right sided Carrilero - in this instance Luis - can attack a really dangerous position outside of the opposition DM. The opposition could press with the left back and leave space for Fernandes to overlap. ..or the DM and open space for Cervi. ..or the DC and Talisca has an open run at goal. As play develops we also have Xadas and Grimaldo both in fairly open space on the opposite flank. This time we attack through the middle. Porto once again have a strong defensive set up. Their AMC is putting pressure in Fejsa, who is OK but not the best on the ball. Their AMR/L are tracking our wingbacks and cutting off a pass. They have 2 DMCs shielding their back four. Despite all of this, look at the space Florentino Luis finds himself in. Our Carrilero's have advanced towards the AM strata, creating a 3v2 in "Zone 14". This time he is our pressure valve. One pass and we have escaped the Porto press. Once we hit Luis - again - we have options. DMCs shifting across opens space for either Cervi or Xadas. Centre back coming forward leaves a striker free. Another similar scenario. This time Cervi on the ball in the Attacking Midfield position. Again, Porto are well structured defensively. AMR, AML and AMC have all dropped back into midfield. Cervi is under pressure in a crowded midfield. Again, the Carrilero advances into that AM position in the half-space and is in acres of space. Draw the fullback and play Fernandes in behind to cross. Attempt to play a through ball to Talisca if the central defender presses. Although something tells me that next season we might line up a little differently..
Edited August 11, 2018 by Ö-zil to the Arsenal! The suggested system, that AO writes about in that article, looks quite identical with your new system. At least the structure of it - especially the use of the carrielos and the diamond - and using a number 10 to pin a DM and two strikers to pin down the centerbacks and the WB's to hold the width and stretch opponents fullbacks. I am experimenting with a system like that - with the main purpose to break down those Burnley busses with Liverpool. Hah I have this open in my tabs!! Will you be breaking down the two legs against City? And a final question, who were the two losses? 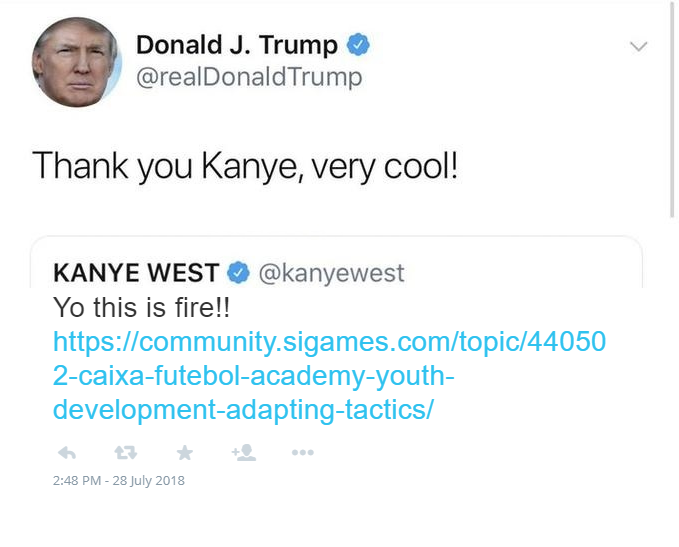 Edit: Where were you playing Filipe? It says he plays at MR..
Ah, yes. That's interesting. Thank you for sharing. I actually have not faced a 5-4-1 in Portugal but the principles are similar. Ah, no. There are a few things which just come from experience & experimentation. 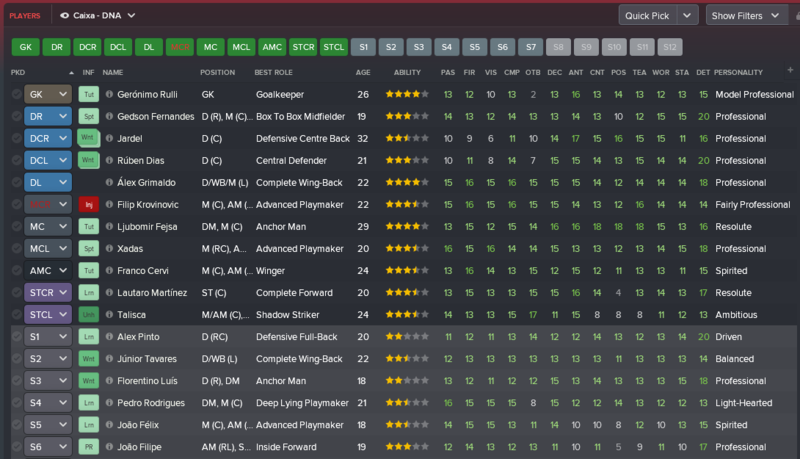 If you're on FM 2017, one of the most useful things you can do is modify your skin to show individual mentality - then you can see for yourself exactly what's going on. If no player is assigned Attack duty, the individual mentality of every player on Support is increased. Massive application, for me. Surprised more aren't using this. I love it. Incredible football. This does not apply to every Mentality / Shape combination, so always double check. Only really relevant on Control & above, otherwise the starting mentality of a Support player is too low in the first place. Exploit the Middle increases the mentality of DC, DMC, and MC players on Defend and DMC players on Support. Useful application creating compactness in the centre without using a more fluid shape. Look for Overlap increases the mentality of DR/DL and decreases mentality of MR/L or AMR/L. Useful application creating compactness on the flanks without using a more fluid shape. Eg. 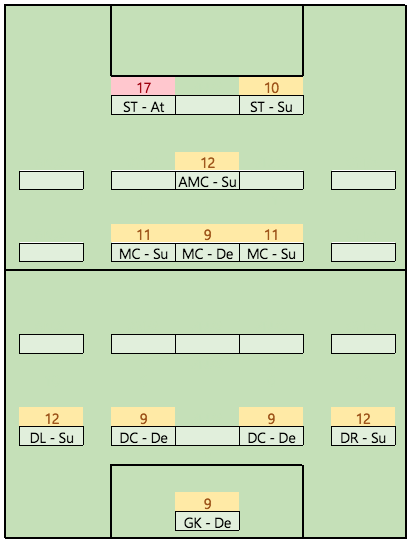 in my Standard, Structured 4-2-3-1 without Overlap my Wingbacks have a mentality of 8 and Wingers have 11. 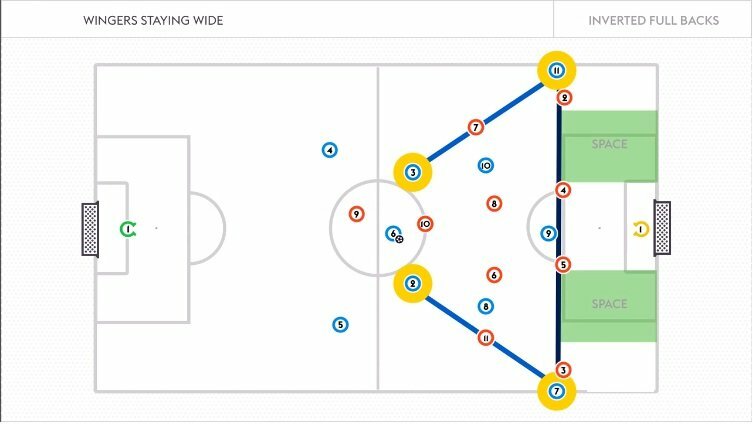 Add Overlap and both Wingbacks & Wingers are on 10 which gives me a nice compact flank, perfectly balanced and both contributing forward and getting back. There's bound to be more but those are the few I have spotted and use regularly. 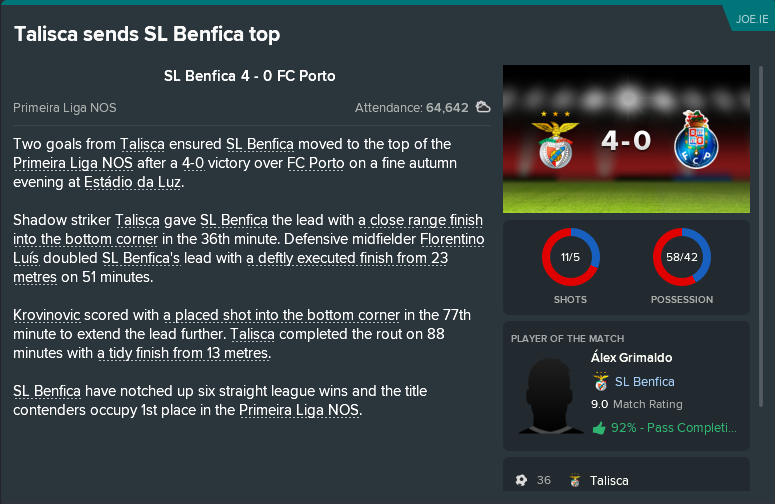 The 4-1-4-1 is alive and well in the cups and matches where I can rotate in the league. Edited August 12, 2018 by Ö-zil to the Arsenal!